This volume provides a snapshot of the current and future trends in turbulence research across a range of disciplines. It provides an overview of the key challenges that face scientific and engineering communities in the context of huge databases of turbulence information currently being generated, yet poorly mined. These challenges include coherent structures and their control, wall turbulence and control, multi-scale turbulence, the impact of turbulence on energy generation and turbulence data manipulation strategies. The motivation for this volume is to assist the reader to make physical sense of these data deluges so as to inform both the research community as well as to advance practical outcomes from what is learned. Outcomes presented in this collection provide industry with information that impacts their activities, such as minimizing impact of wind farms, opportunities for understanding large scale wind events and large eddy simulation of the hydrodynamics of bays and lakes thereby increasing energy efficiencies, and minimizing emissions and noise from jet engines. Makes the case for why funding agencies and scientists around the world need to lead a global effort to establish and steward large stores of turbulence data, rather than leaving them to individual researchers. 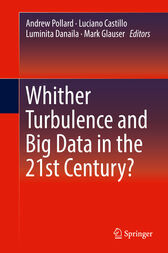 Title: Whither Turbulence and Big Data in the 21st Century?